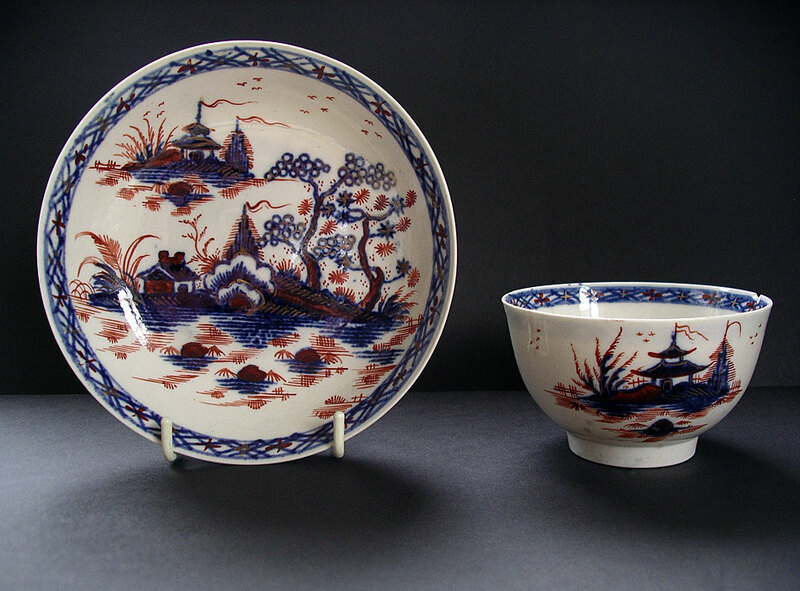 "A rare Liverpool English porcelain teabowl and saucer set dating from around 1760: attractively hand decorated in blue with a painted chinoiserie pattern of watery Cannonball landscapes. 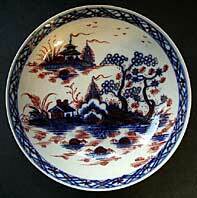 It is further overpainted in Imari colours of red and gold in a style that resembles some Liverpool delftwares. These rare and highly desirable tea set pieces might easily have once been mistaken for Worcester. This Liverpool teabowl and saucer set is by Richard Chaffers and Company." Antiques Expert Hamilton Bear. References: Attribution within the Liverpool factories is subject to recent review and debate and must be accepted in good faith. For comparison with a Richard Chaffers phosphatic-type teapot with stylistically similar decoration and identical palette of colours see Bernard Watney, Liverpool Porcelain, colour plate 3a. page 123. Dimensions: width saucer 131 mm max. height teabowl 70 mm max. Condition: The piece is in good display condition but with some typical faults. Condition report: a rim chip to the teabowl and separate short faint hairline from rim. The saucer has a hairline which extends across the top side. This is visible from the front but well hidden/lost in the decoration. Not a significant point of weakness that will worsen, so the saucer is very stable. No restoration to teabowl or saucer. Decoration to both pieces remains excellent with no significant rubbing wear.